Meanwhile, spray 9-inch glass pie plate with cooking spray. In small bowl, mix eggs, milk, salt and pepper. Pour into pie plate. Microwave uncovered on High about 1 minute 30 seconds, lifting edge with spatula to let egg mixture run underneath every 30 seconds, until set. Fold in half; if still wet, microwave 30 seconds longer. Sprinkle with cheese. Cover with plastic wrap. Microwave bacon as directed on package. Split warm biscuits horizontally; place on 4 individual serving plates. Cut eggs into 4 wedges. 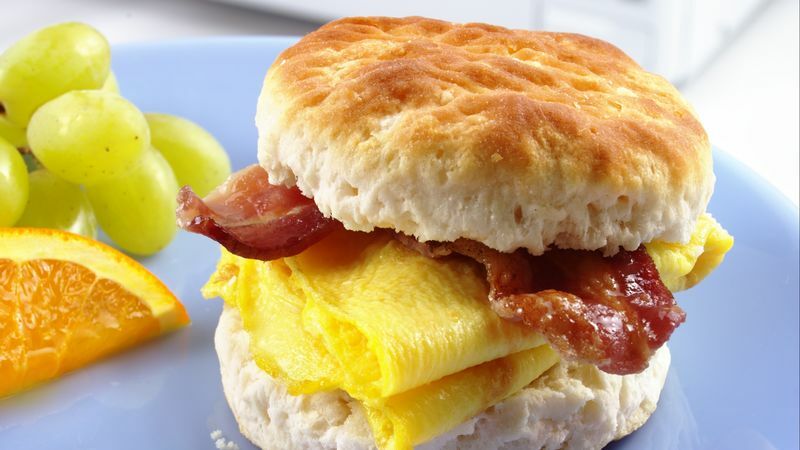 Place eggs and bacon on bottom halves of biscuits. Cover with top halves of biscuits. Use fully cooked sausage patties or slices of ham in place of the bacon.